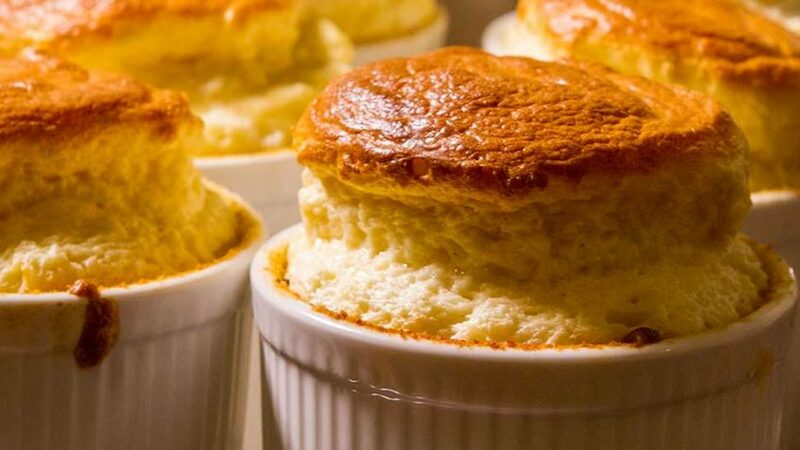 Souffles can be somewhat daunting when making for a group of people as you can never predict the outcome. Not to mention that by the time you bring out the second lot, they have deflated well below the “what I call the wow line”. By double baking them, you can prepare them in advance, even the day before and all you need to do is simply reheat them outside of their moulds. They will re-puff and the wow factor comes back into effect. Made with Camembert cheese, truly brings this cheese souffle to a whole new level that will impress! In a saucepan over moderate heat, melt the butter then add the flour. Mix well over heat for 60 seconds. Leave aside to cool a little. Bring milk to the boil with a pinch of salt. Add to butter and flour mixture and whisk well off heat until thickened. Add 4 yolks to the mixture one at a time and mix well. 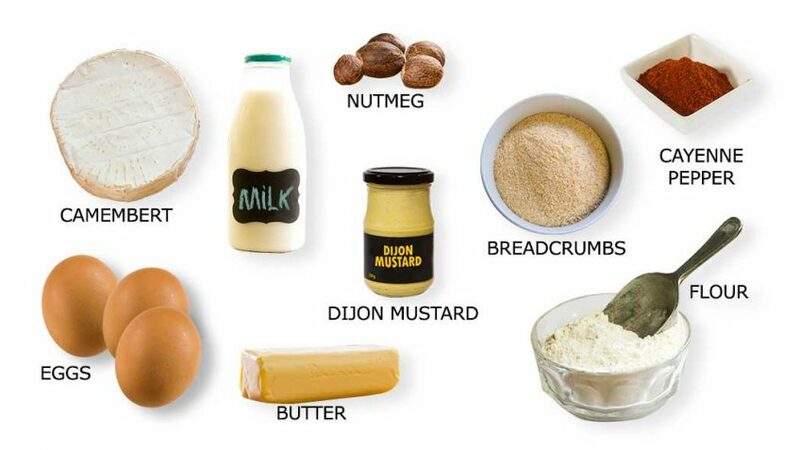 Add the mustard. Dice the camembert cheese into small pieces and add to mixture, mix well. Whisk the egg whites either by hand or using a machine. Stiff peaks. Add half of the whisked egg whites to the mixture and mix well. Then gently fold the remaining whisked egg whites. Grease the moulds with melted butter using a brush vertically then line with breadcrumbs. Fill the moulds three quarters of the way up. Place on a sheet pan and bake at 400°F – 200°C for 15 minutes or until risen. Leave to cool for 10 minutes, they will collapse, that’s quite normal. Then using a kitchen towel so you don’t burn your hands, remove each soufflé from the ramekins. Cover and refrigerate for future use. To reheat, bake in oven for 10-15 min or until puffed at 375°F – 190°C. Serve immediately. If eating the soufflés straight away, then cook 10 minutes longer. This recipe leaves the centres slightly undercooked so they will re puff on the second bake. Works well served with a green salad, French dressing and some roasted pinenuts.